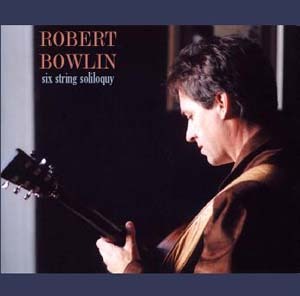 Flatpicking Guitar Magazine reviewed a pre-release copy of Robert Bowlin's "Six String Soliloquy" CD in the magazine's Volume 11, Number 4 issue. Since then, Robert has gone back in the studio to re-record and add to the project. This CD is an example of solo flatpicking at its finest, by a masterful and tasteful flatpicker. When the pre-release version came out last summer, there was some buzz on the internet listserv group, Flatpick-L. Here is what list member Dan Mozell had to say: "There are lots of guitarists these days who have great technique and can generate excitement with hot picking. Robert can certainly do the same. But there are few who work with the full range of emotion that is possible in music. These are medium and slow paced solos intended to move the listener. This is really one of the finest guitar recordings I’ve heard in years." "FGM Records is the recording arm of Flatpicking Guitar Magazine, and it specializes in giving solo opportunities to guitarists best known as backup musicians. Robert Bowlin is a case in point, a Nashville accompanist with a long list of recording sessions and touring work behind country stars. The title Six String Soliloquy suggests the format he has chosen for his debut in the spotlight; it consists entirely of solo acoustic guitar instrumentals. (Bowlin is also an accomplished fiddler and plays several other instruments as well.) Many of the tunes are originals, but they really just serve as springboards for the demonstration of the guitarist's dexterity and virtuosity. His playing is always well articulated, and he maintains interest by varying his effects. He also calls to mind other players in various styles, sometimes mixing them up. The unfortunately titled "The Rain in Spain" (no, it's not the song from My Fair Lady, it's an original) gives an impression of what "The Water Is Wide" might sound like if it were being played by Django Reinhardt. Among Bowlin's many credits is one of those "Pickin' On" albums devoted to the work of Bruce Springsteen. "Eastland Dream" proves that Bowlin is more than ready to do a similar volume on James Taylor. Indeed, many folk-pop performers come to mine (Steve Goodman, for another) as Bowlin ranges around his instrument. Sometimes on their FGM albums, guitarists make a point of singing and asserting a style consistent with frontman status. Bowlin seems content to reveal just what a good guitarist he is, and leave it at that."